You might be well versed in the ways of the Force, but despite being able to fast and meditate your way through situations, it would take a very strong minded person to turn down a BBQ invitation. Trust me on this – even Darth Vader himself rued the day he decided to take on his master Obi-Wan when the latter had the high ground, since he then lost his limbs to make BBQs for his children, not to mention being unable to chew on those delicious Ewok meat that has been seasoned and skewered, finely BBQed to his liking back when he did not have to remain alive by being perpetually hooked up to a life support machine. 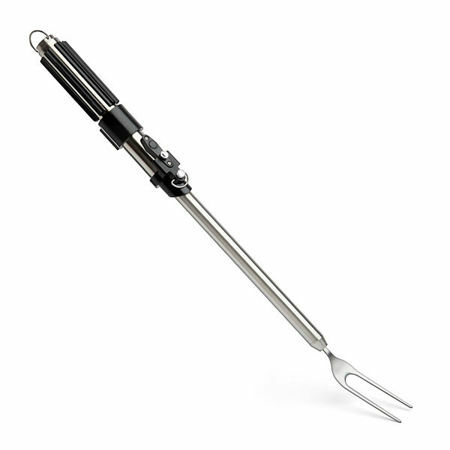 The $24.99 Star Wars Darth Vader Lightsaber BBQ Fork is the ideal tool for the Jedi griller in your circle of family and friends.